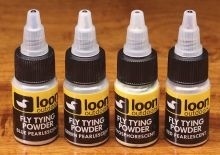 The new Loon Pearlescent Fly Tying powder gives tyers the ability to add pigment and sparkle to their tying cements. Available in Red, White, Blue and Green, they can be used to completely alter the appearance of a fly, or give a subtle flash. 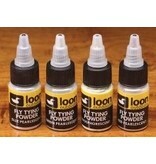 They are compatible with traditional cements as well as UV cured resins.